McGee Creek - Near Crowley lake. Just north of Crowley Lake, this dramatic Canyon is a sure bet for a multitude of wildflowers once the snow melts, and lasts through July! Heart Lake - Mammoth Lakes Basin. Just Beyond Coldwater Campground in the Mammoth lakes Basin, the trail to Heart lake offers hillsides and meadows of wildflowers. Twenty lakes Basin - Saddlebag lake. 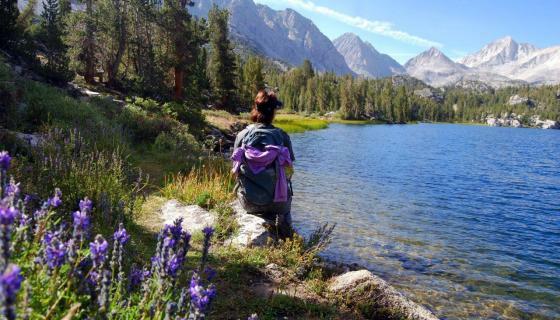 Located at the west end of Saddlebag Lake, this five-mile loop has meadows of wildflowers that bloom later in the summer due to its higher elevation. Bridgeport Valley - Bridgeport. 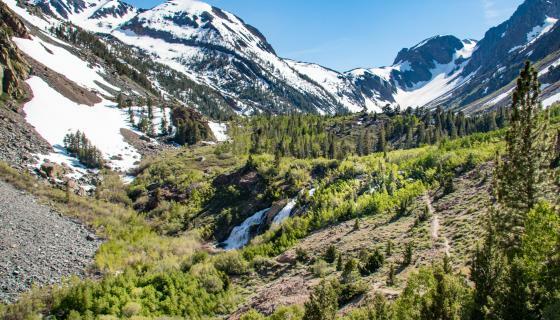 The sunny Bridgeport Valley tends to lose its snow earlier than elsewhere in the county, bringing fields of wild iris and lupine to life in mid to late June. East of the valley, the Bodie Hills are higher in elevation and usually blossom a bit later. Mill Canyon - Walker & Coleville. Mill Canyon, between the towns of Walker and Coleville in a paradise for wildflower seekers, usually in mid-May. The Golden Gate Mine Road offers fields bright with wild mustard, mule ears, lupine and wild iris. Rainbow Falls - Devils Postpile. The most dramatic waterfall on the San Joaquin River (Middle Fork), Rainbow Falls plummets 101 feet and is an easy two-mile hike from Devils Postpile National Monument. On most sunny afternoons it delights onlookers with a perfect rainbow. Horsetail Falls - June Lake. The June Lake Loop&apos;s crown jewel of waterfalls, Horsetail Falls can be easily seen along Highway 158 every spring. Lundy Falls - Lee Vining. The two most photographed Mill Creek waterfalls are found along the Lundy Canyon Trail. Horsetail Falls - Bridgeport. Tumbling 360 feet into Upper Twin Lakes, Horsetail Falls is located at Upper Twin Lakes just west of Bridgeport along Horse Creek Trail. Leavitt Falls - Sonora Pass. This multi-tiered, 200-foot waterfall can be seen from a wonderful viewing platform right off SR 108, just a few miles from Leavitt Meadows.